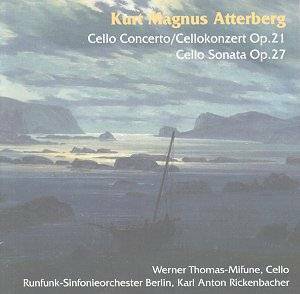 Atterberg's music has been enjoying a slowly unfolding renaissance on record since the mid 1970s. A Swedish romantic, he has a very large output much of which is still inaccessible on disc. His symphonies 1-6 have been available piece-meal across a variety of labels. Until very recently the last three symphonies were a closed book unless you were prepared to explore the highways and byways of off-air tape collections. Sterling's wonderful CD of symphonies 7 (Romantica) and 8 has now given us all but one of the symphonies. The last symphony is the forty minute Visionaria (No. 9) for soloists, chorus and orchestra - a grim work known to me from an aircheck in the version conducted by Fougstedt with Kim Borg as soloist. Rather like Malcolm Arnold there is also a fine Symphony for Strings. We very much need recordings of the double concerto and the piano and violin concertos. The three interludes from his Thousand and One Nights opera Fanal plus the tone poem The River (nothing to do with Palmgren's similarly titled second piano concerto) would also more than repay the investment. I have only scratched the surface. Mifune adventurous soloist - witness his recorded repertoire which includes the Grachaninov suite, the Rubinstein concertos and the Khachaturyan concerto. In the present recording (I have not heard the others!) there is no suspicion of time-serving. On the contrary the impression left is of an artist at the service of the music. The Concerto's andante cantabile first movement is an audacious introduction where an awed vibrato from the high violins provides a bed of sound over which the solo cello sings. The cello part projects music shaken wretched and shivering with dark and compelling emotion. A gloomy and cataclysmic tone winds in and out of the work leavened by the soloist's impassioned song. This is truly a work of late romantic fervour. Going by the sound of several passages Atterberg seems to have been deeply impressed by Sibelius whose second symphony and Humoresques (violin and orchestra) were clearly an influence. Add to that many pages where Atterberg seems dead set on becoming the Swedish Korngold and you have a work to reckon with. Lissom tunes, golden taste, regret and Elgarian bite summarise this major discovery. If there were any justice the work would have become a repertory standard years ago. The CD cover is CD Friedrich's painting of Nordic Sea in Moonlight. Recommended - especially to pursuers of Scandinavian romanticism. Your investment will be richly rewarded.